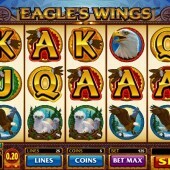 Calm down, fans of fighter jets and flying-related slots: this 5 reel, 25 pay-line video slot from online developer Microgaming is literally about eagles’ wings. Planted firmly in the slots camp marked, ‘Nature’ - or ‘Buffalo Spirit-inspired slots’ if that describes this a little better - Eagle’s Wings takes you on a flight of the American outdoors where eagles soar, native American totem poles stand erect (stop sniggering at the back) and salmon leap out of rivers like leapy, salmony things. Neat little animations play out whenever you hit a winning combo, and I particularly liked the salmon doing a little dive into the river whenever it’s used. The regular poker symbols, 10-through-Ace, also do a little native American jig if making a winning line. If you’ve ever played the hugely popular Buffalo slot from Aristocrat, you should get the vibe. The Eagle’s Wings logo is Wild and substitutes for all regular symbols other than the Scatter. It also appears Stacked, meaning you’ll get plenty of little wins through the game, plus all winning combos that the Wild symbol forms pay out double. The Scatter is the ‘Lucky Eagle’ Indian totem symbol, and three or more triggers a free spins bonus round. First you get to choose how many spins you’re entitled to. Choose the correct coins and you could bag 60 free spins – a really generous amount. Not only that, but the spins will see your wins multiplied by three, and the spins can be re-triggered. 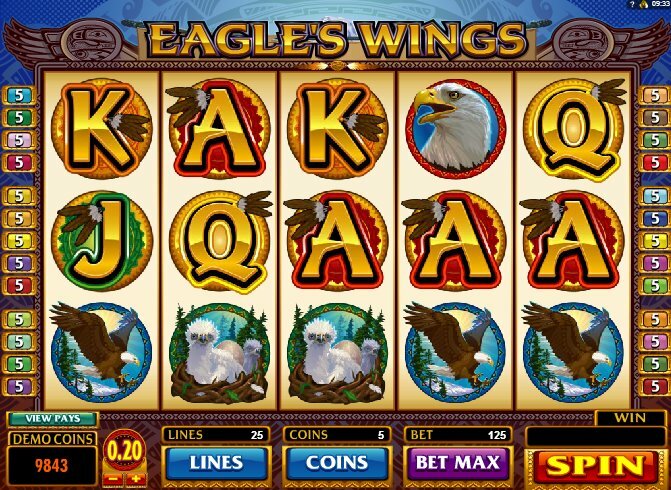 With some nice animation, slick graphics and the overall knowledge that you’re in safe hands with a Microgaming slot, Eagle’s Wings soars: the bonus rounds are generous, the Stacked Wilds make things interesting in the base game, and the atmosphere is great. In style it’s very close to the Buffalo slot from Aristocrat I mentioned at the top of the review; in fact, in terms of online slots it’s probably closest to another Microgaming outdoors-themed slot – Alaskan Fishing. With stacked wilds too, and Microgaming’s customary 243-ways-to-win system, it’s definitely worth checking out.